Most of us have been in situations where we have to debug performance problems in Java based applications based on little more information than thread dumps and the garbage collection logs. With the many tunable parameters that the newer JVMs offer, its easy to get the garbage collection configuration wrong for your environment. Fortunately, the latest JVMs offer ergonomics, where less is more - you specify a few parameters for tuning, and let the JVM figure out the rest. If you invoke the JVM with the -Xloggc:logfile parameter, the Garbage Collector (GC) will faithfully write out what its doing to the named logfile. 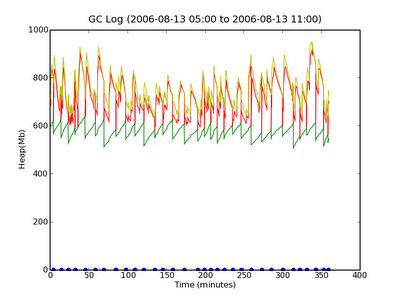 Each line in the log file corresponds to a GC operation. There are two kinds of lines, one for partial GC and one for full GC. While there is lot of information about the GC operation in the line, it is hard to see interrelations between successive GC operations and its correlation with thread spikes on the application server. I think the main problem is the timestamp. If it had been a regular ISO-8601 style timestamp, then it would be much more useful for troubleshooting. Anyway, so there I was, trying to correlate thread dumps to an increase in frequency in garbage collection, trying to answer whether the garbage collection tuning parameters we had chosen were "correct" for the application, and it occured to me that it would be fairly easy and immensely helpful to be able to see these numbers in a chart. The script that does the charting is written in Python, and uses an open source 2D plotting library called matplotlib, also written in Python. Install freetype, libpng, zlib - I already had the binary RPMs in my Fedora Core 3 system, as well as zlib-devel. So the only things I needed was freetype-devel and libpng-devel. Set up matplotlibrc - I did not have TkInter installed, so I could not use any of the windowing toolkits for graphics. So I set the backend in .matplotlib/matplotlibrc file to Agg. Once matplotlib was installed, the code was fairly simple. Basically, the GC log is read line by line, matched to one of the regular expressions for partial or full GC, and tokenized. These tokens are then appended to a series of arrays. Once all the lines have been read, some postprocessing is done on some of the arrays to normalize the timestamps relative to the creation time of the log file (so we get real timestamps instead of seconds since JVM startup). Parses an input line from gc.log into a set of tokens and returns them. line graphs and one series of points. Prints the script's usage guide. print "Usage: gcview.py input output [time-start] [time-end]"
print "input = path to gc.log file"
print "output = path to gc.png file"
print "time-start = date in yyyy-MM-dd HH:mm format"
print "time-end = date in yyyy-MM-dd HH:mm format"
yyyy-MM-dd HH:mm and converts it to seconds since the epoch. line was written. We do this by getting the ctime of the gc.log file. pushing the tokens into arrays that are passed into the drawGraph() method. 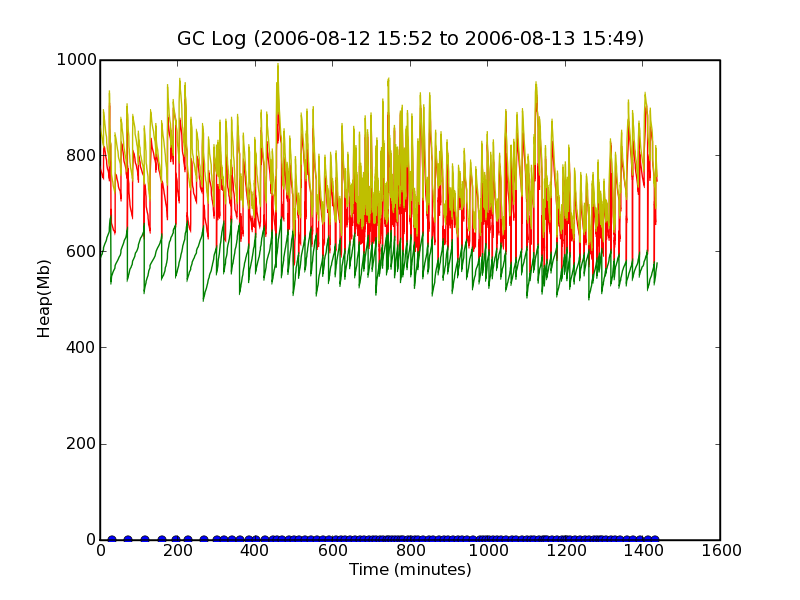 ./gcview.py ../tmp/gc.log gc-6h.png "2006-08-13 05:00" "2006-08-13 11:00"
./gcview.py ../tmp/gc.log gc-2h.png "2006-08-13 09:00" "2006-08-13 11:00"
./gcview.py ../tmp/gc.log gc-1h.png "2006-08-13 10:00" "2006-08-13 11:00"
This results in a chart like this one. 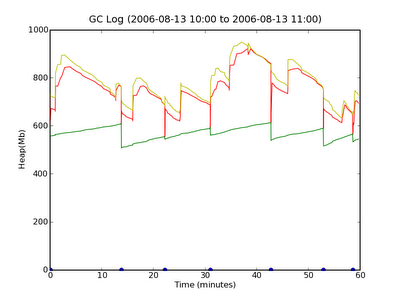 As you can see, the data in the GC log file spans 24 hours (1440 minutes, from 4pm to 4pm). 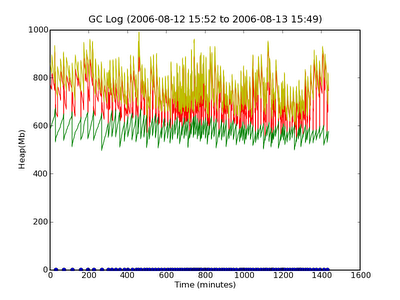 The yellow line represents the JVM heap size, the red line represents heap usage before GC, and the green line represents heap usage after GC. The heap sizes are in MB. The blue dots on the X-axis represent the points where Full GC occured. The data, unfortunately is quite dense and does not tell us much, except perhaps that JVM heap size reached a max of 1GB somewhere in the 400-600 minute range. 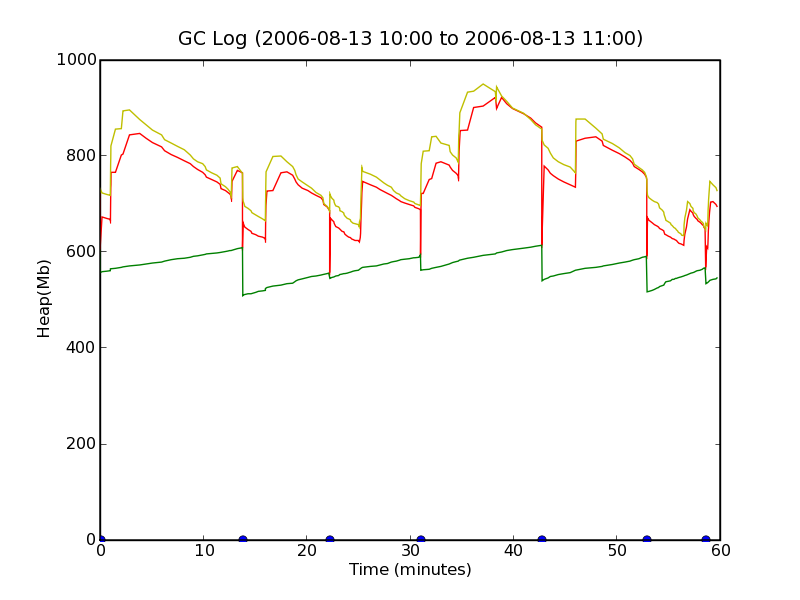 It also looks like Full GC happens continuously about 300 minutes into the GC log file, which cant be good, but as we shall see, this is because the scale of the graph is too small. To verify that there really is not continous GC going on, we will take a look at a 6 hour slice in the busy period (5am to 11pm the second day of the log). 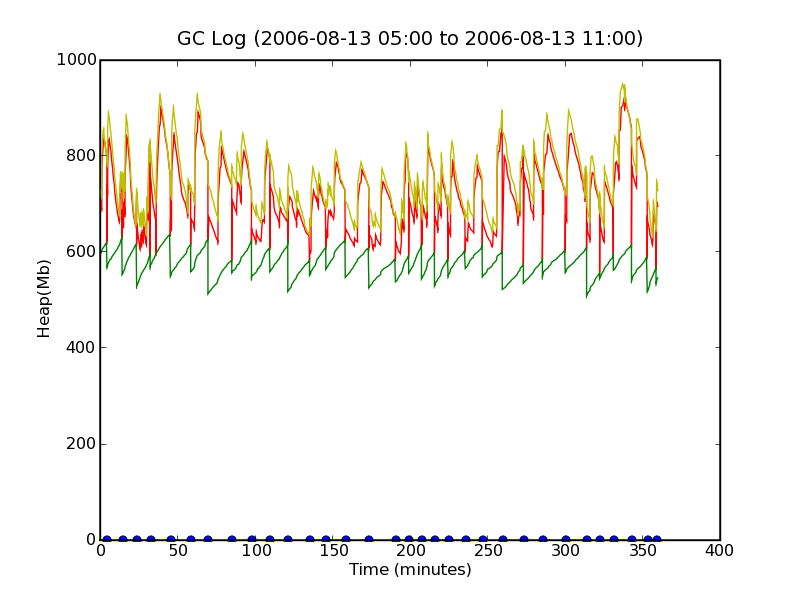 $ gcview.py gc.log gc-6h.png "2006-08-13 05:00" "2006-08-13 11:00"
This shows us that there is indeed a more frequent occurence of full GCs at about 8am-9am, and again at 10am-11am, but that normally, full GC happens approximately once every 10 minutes or so. Drilling down further into the 10am-11am band to check if we can see something. which looks fairly normal. So in our case, we do see more Full GCs happening during times where there are more threads in use in the JVM. What conclusion we would draw from this would depend on other inputs that we have. I hope you will agree that looking at a chart is more enlightening that looking at a series of log lines. Conversion is quite painless with the script, compared to other approaches I have heard being used, such as parsing the GC log, importing it into Excel, etc. It is also platform independent, since it is all Python, which works on Windows, Linux and Mac OSX. There is some pre-work required with this approach, such as installing matplotlib, but that is a one-time deal. Anyway, I think this script is a useful addition to the Java programmer's collection of tools, and I hope you find it useful too. Where am I right or wrong? I am no GC logging expert, but I found this web page from Sun which provides some details about the log format. There is an example of a 3 part log line, the first part deals with the Young generation, the second the Tenured generation, and the third the total. Based on that format, and given that you dont have the second part in your example, I think your interpretation is correct. If you started your VM with different values of -Xms and -Xmx, then the VM size can be different on each line. AFAIK, the VM size will never shrink, it will keep increasing as needed until -Xmx is reached. Thank you so much for posting this. I modified the regular expressions for the extended gc log format. Here is the modified code. You're welcome, and thanks for the regex modification. Hi, thanks, and glad it helped. Hey guys -- This was very useful information for me to build my Splunk extractions out of. BTW. Using Splunk (www.splunk.com) is WAY easier than using any graphic library to generate a graph and its free. Let me know if you want the extractions, sample reports that you can generate. Hi Simon, glad it helped and thanks for the pointer to Splunk. I looked at Splunk sometime back, but it appeared at the time to have a pretty steep learning curve. So it would be great if you can provide your code and/or pointers to learning about Splunk. Simon, can you tell me how you are gathering Java GC reports via Splunk and can you send me a link to the sample data? Thanks a lot. Very good explanation of the gc log. This help me too. Thanks Chandana, glad it helped you. Sujit - I borrowed some of your content. I will remove it if you want, just let me know. @Simon: thats completely fine, and I took a look at your post too - very nice. @Sattish: did you apply the two changes that Anonymous points out in the comments? Your situation looks like what he fixed. I will shortly apply these changes to the code in the post as well. Hi quartet, I don't use Splunk, so sorry, can't help you there. The post here describes a script I wrote to graph my JVMs garbage collection log. You may want to post this request on Simon Shelston's post on this topic, they would be more qualified to help you. IN my gc.log file I could see ^@^@^@ characters in first line every time log rotate take place. Whats the reason? Hi TuxBuddy, from this page, it appears that this may be an artifact of the log rotate process, rather than something written by the gc. I would just delete the offending characters before analysis. I am using the script to great some graphs of java6 gc output. Any idea what can be the root cause of this output? Hi Albert, the line numbers in the stack trace don't match the script in the post (line 218 in the first line, there are only 182 lines in the script) - I am guessing you may have some extra code in there which is pushing the lines down...However, it appears to be in the drawGraph() function, and the error message is "IndexError: index out of range for array" so I suspect that the arrays you are passing into drawGraph are not the same size or perhaps empty or something. To debug, you can pass in the arrays one by one and see which one dies. This would point to incorrect parsing of that dataset from the gc logs, possibly because the format of the gc log may have changed or different (haven't done this in a while, but I believe you can configure the gc logs) from the one I used. File "./gcview.py", line 181, in ? It looks like the format of your GC log is different from mine, I suspect you need to tinker with the regular expressions in the parse() method to match with this format. This is my GC file format "2014-02-21T04:41:08.601-0500: 10.959: [GC2014-02-21T04:41:08.601-0500: 10.959: [ParNew: 1677824K->209663K(1887488K), 0.9136870 secs] 1677824K->270291K(3984640K), 0.9138940 secs] [Times: user=0.89 sys=0.06, real=0.91 secs]"
Can you guide me how to change the parse method as per this format? Hi Hitesh, I've deleted your other two comments because they were near-duplicates. To answer your question about how to compile python in the deleted comments, python is an interpreted language, so you invoke it like a shell script from the command line - in case that doesn't work its most likely because python is either not installed on your system or installed at a location other than /usr/bin/python (you can check the correct value with "which python" and replace the first line). Alternatively, you can call it with python, ie "python gcview.py ...". With regard to your file format question, the parsing work in gcview.py happens in the parse() method - I use a single regexp to parse the incoming line into groups (see line 25) which is used by the rest of the application for graphing. Regex patterns used is mostly similar to Java (I assume you are coming from Java since you are asking about GC), but this pydoc page lists out the metacharacters used, should help you figure out the pattern to use.